What Are VST Plugins and What Do They Do? Virtual Studio Technology (VST) plugins are used by both amateur and professional recording engineers and artists to enhance their audio projects. A plugin is a type of software that works inside another piece of software. Instead of working on its own, you plug it into something else. In this case, VST plugins are compatible with all of the most popular digital audio workstation (DAW) applications that you can use to make music in both home and professional studio settings. With VST instrument and effect plugins, you can implement a massive variety of virtual instruments and effects into an audio recording to create a significantly more compelling final product. What Are VST Plugins For? The original method of recording and mixing required physical instruments and physical hardware to accomplish effects like compression and reverb. The equipment required for this type of work is prohibitively expensive and takes up a lot of space. Virtual Studio Technology was developed to replace, or compliment, physical equipment. Instead of investing a bunch of money in instruments, synthesizers, effects hardware, and other expensive gear, you can use VST plugins that are capable of performing the same basic functions. In fact, you can create an entire song from scratch, using VST plugins and the DAW of your choice, without ever touching a physical instrument at all. VST instruments - These plugins are capable of generating audio that sounds like it was created by a synthesizer or a more traditional instrument like a piano or guitar. A lot of VSTi plugins are designed to sound, and look, like popular hardware synthesizers. VST effects - These plugins take audio and modify it in a variety of different ways. They can't create new audio on their own, but the can add reverb and other effects. This category also includes plugins that provide different types of visual feedback. VST MIDI effects - These plugins are designed specifically to work with Musical Instrument Digital Interface (MIDI) data, either on their own or in concert with other VST plugins. VST instrument plugins, also known as VSTi plugins, are used to emulate various instruments within digital audio workstations. You can emulate just about any instrument with a VSTi for a whole lot less than the cost of buying the actual instrument. The benefit of VSTi plugins is that they allow you to essentially make music from scratch that sounds like it was played on an instrument, like a piano or saxophone, or created with a synthesizer. One of the most attractive things about VSTi plugins is that they're capable of emulating synths like the Moog Voyager, Yamaha CS-80, Hammond B3, and many others. These synths are famous for their iconic sounds, and they're so expensive that buying one isn't something that most people will ever be able to do. You can find a lot of great VSTi plugins for free, and even premium VSTi plugins tend to be a lot more affordable than the physical hardware they're designed to emulate. Where VSTi plugins create audio from scratch, VST effects plugins take that audio and alter it in a huge variety of ways. These plugins are often modeled after real, physical effects hardware in the same way that a a lot of VSTi plugins are designed to sound like real instruments and synthesizers. Most DAWs come with some built-in capabilities to add effects and fine tune your mix, but VST effects plugins take it to the next level. They perform the same functions that are handled by the kind of expensive, bulky hardware audio processors that you would normally find in a studio rack. Any kind of effect that you can apply to an audio track can be accomplished with a VST effects plugin. Whether you want to add a simple reverb or pan, or mimic the sounds of the 80s in a synthwave track, you can do it with effects plugins. VST MIDI plugins are like effects plugins in that they don't create audio, but they're designed to work with midi data. These plugins can process MIDI data on their own, or modify it and then pass it to other plugins. VST MIDI plugins can perform relatively basic tasks like transposing or arpeggiation, but that's just the tip of the iceberg. MIDI is a powerful tool, but chart-based MIDI compositions can sound artificial to the practiced ear. With the aid of the right VST plugin, you can actually make MIDI inputs sound more natural, and alter them in all sorts of other ways. 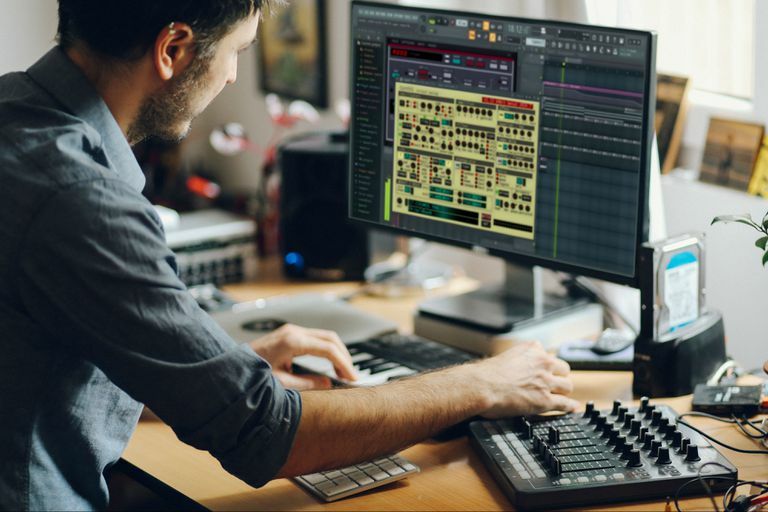 Virtual Studio Technology is designed in such a way that some VSTs are capable of operating on their own, but VST plugins are specifically meant for use within digital audio workstations. If you want to use a VST plugin, you first need to download and install a DAW like Ableton Live, FL Studio, or Sonar. Locate a VST plugin you want, and download it. If the plugin is contained in a ZIP file, unzip it. Place the unzipped VST plugin files in a folder where you will be able to keep track of them. If the VST comes with an executable file, run it. This will initiate an installation process that will typically allow you to choose the installation folder for the VST. Launch your DAW, and have it search for new VSTs. Create a new project in your DAW, and select your new VSTi as an instrument, or place your new effects VST on a track using the mixer. iRig Keys: The Best Music Keyboard for Your iOS Device? Creating Digital Music: What Does DAW Software Do? Dolby Atmos Provides More Home Theater Setup Options - But Is It Worth It?